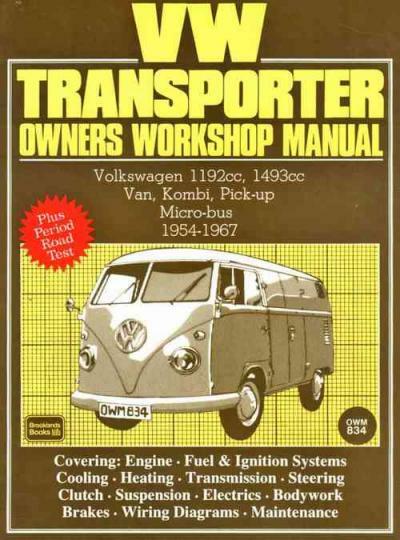 Volkswagen VW Transporter 1954 - 1967 Owners Workshop Manual is a Re-issue of Autobooks manual. The idea the Type 2 was paid to Dutch Volkswagen importer Ben Pon. (It has similarities in concept to your 1920s Rumpler Tropfenwagen and 1930s Dymaxion vehicle by Buckminster Fuller, neither which hit manufacturing.) Pon visited Wolfsburg in 1946, going to buying Type 1s for import to your Netherlands, where he spotted an improvised parts-mover and understood things best was possible with the stock Type 1 pan. He very first sketched the van in a doodle dated April 23, 1947, proposing a payload of 690 kg (1,520 lb) and putting the motorist at extremely front. Production will have to wait, but while the factory is at ability creating the Type 1. When capacity freed up, a model known internally while the means 29 was manufactured in a short 90 days. The inventory kind 1 cooking pan turned out to be too weak so that the prototype put a ladder framework with product human body construction. Coincidentally the wheelbase was the same as the Type 1's. Engineers used again the reduction equipment from the means 81, enabling the 1.5 great deal van to utilize a 25 hp (19 kW) level four system. Although the aerodynamics of the first prototypes were poor (with a preliminary drag coefficient of Cd=0.75), designers put the wind tunnel at the Technical institution of Braunschweig to enhance the look. Easy changes eg splitting the windshield and roofline into a "vee" helped the production kind 2 attain Cd=0.44, exceeding the Type 1's Cd=0.48. Volkswagen's new chief executive officer Heinz Nordhoff (appointed 1 January 1948) approved the van for production on 19 May 1949 therefore the very first production design, today designated means 2, rolled off the assembly line to debut 12 November. Just two products had been supplied: the Kombi (with two part house windows and middle and back chairs which were effortlessly detachable by one person), as well as the Commercial. The Microbus was added in May 1950, joined up with because of the luxurious Microbus in Summer 1951. Throughout 9,541 Type 2s were stated in their first year of manufacturing. An ambulance model ended up being included in December 1951 which repositioned the gas container as you're watching transaxle, put the free tire behind leading chair, and included a "tailgate"-style rear door. These functions became standard regarding Type 2 from 1955 to 1967. 11,805 Type 2s are built in the 1951 model 12 months. We were holding joined up with by a single-cab pickup in August 1952, also it changed the least of Type 2s until all were greatly altered in 1968. Unlike various other back motor Volkswagens, which evolved constantly in the long run but never saw the development of all-new brands, the Transporter not just developed, but is totally modified occasionally with variants retrospectively called variations "T1" to "T5" (a nomenclature just invented after the introduction associated with front-drive T4 which replaced the T25). But just generations T1 to T3 (or T25 because it's still known as in Ireland and britain) can be seen as directly linked to the Beetle (read below for details). The Type 2, combined with 1947 Citron H Van, are among the first 'forward controls' vans when the driver is put over the front side roadwheels. They going a trend in European countries, where 1952 GM Bedford CA, 1958 RAF-977, 1959 Renault Estafette, 1960 BMC Morris J4, and 1960 Commer FC in addition used the idea. In the us, the Corvair-based Chevrolet Corvan cargo van and Greenbrier traveler van moved in terms of to duplicate the sort 2's rear-engine layout, utilising the Corvair's horizontally compared, air-cooled engine for power. Aside from the Greenbrier and various 1950s--70s Fiat minivans, the sort 2 remained special in-being rear-engined. This is a disadvantage when it comes to early "barndoor" Panel Vans, that could perhaps not effortlessly feel filled from the back due to the fact motor cover intruded on interior room, but typically beneficial in grip and interior noise. In 1896, Karl Benz invented 1st internal combustion motor with horizontally opposed pistons. He labeled as it the kontra engine, due to the fact action of every part opposed the action for the more. This build has actually since become called the "boxer" engine because each couple of pistons moves in and out together, instead just like the gloves of a boxer. The boxer motor have pairs of pistons reaching TDC at the same time. The boxer setup may be the only configuration in accordance use that will not have actually unbalanced forces with a four-stroke period regardless of the range cylinders, providing both financial institutions have a similar amount of cylinders. They don't require a balance shaft or counterweights on the crankshaft to stabilize the extra weight of reciprocating components, which are required generally in most other motor configurations. But when it comes to boxer engines with under six cylinders, unbalanced moments (a reciprocating torque also called a "rocking couple") is unavoidable due to the "opposite" cylinders being somewhat out of line with each other. Various other system designs with normal powerful balance through the straight-six, the straight-eight, the V12, and the V16. Boxer engines (and flat engines generally) tend to be noisier than many other typical engines both for intrinsic alongside explanations. In vehicles, device clatter from motor area is not damped by environment filters or any other components. The first generation for the Volkswagen means 2 because of the separate windshield, informally labeled as the Microbus, Splitscreen, or Splittie among modern enthusiasts, was made out of 8 March 1950 through the end associated with 1967 design year. From 1950 to 1956, the T1 (not labeled as that at the time) was built in Wolfsburg; from 1956, it was built on completely new Transporter factory in Hanover. Just like the Beetle, 1st Transporters put the 1100 Volkswagen air-cooled system, an 1,131 cc (69.0 cu in), DIN-rated 18 kW (24 PS; 24 bhp), air-cooled flat-four-cylinder 'boxer' motor installed inside rear. This was enhanced on 1200 -- an 1,192 cc (72.7 cu in) 22 kW (30 PS; 30 bhp) in 1953. A greater compression proportion became standard in 1955; while an unusual early form of the 30 kW (41 PS; 40 bhp) system premiered solely on the Type 2 in 1959. This engine proved to be therefore uncharacteristically problematic that Volkswagen remembered all 1959 Transporters and replaced the motors with an updated form of the 30 kW system. Any 1959 systems that hold that early motor today become true survivors. Because the system was totally discontinued first, no section were previously offered. The early versions associated with the T1 until 1955 were often called the "Barndoor" (retrospectively known as T1a because the 1990s), due to the huge rear system address, even though the later models with a somewhat changed system (the roofline above the windshield try longer), modest engine bay, and 15" roadwheels as opposed to the original 16" people were today labeled as the T1b (again, just known as this considering that the 1990s, based on VW's restrospective T1,2,3,4 etc. naming system.). Through the 1963 model 12 months, whenever rear door had been made wider (identical to regarding bay-window or T2), the car could be named the T1c. 1964 additionally spotted the introduction of an optional sliding door when it comes to passenger/cargo location rather than the outwardly hinged doorways typical of cargo vans. In 1962, a heavy-duty Transporter was launched as a factory option. It featured a cargo ability of 1,000 kg (2,205 lb) as opposed to the past 750 kg (1,653 lb), modest but broader 14" roadwheels, and a 1.5 Le, 31 kW (42 PS; 42 bhp) DIN engine. It was so effective that just a year later, the 750 kg, 1.2 L Transporter is stopped. The 1963 design seasons introduced the 1500 system -- 1,493 cc (91.1 cu in) as standard gear towards the US marketplace at 38 kW (52 PS; 51 bhp) DIN with an 83 mm (3.27 in) bore, 69 mm (2.72 in) swing, and 7.8:1 compression proportion. Once the Beetle gotten the 1.5 L motor the 1967 design 12 months, its energy was risen to 40 kW (54 PS; 54 bhp) DIN. German production ended after the 1967 design season; but the T1 however had been manufactured in Brazil until 1975, with regards to ended up being customized with a 1968--79 T2-style front end, and huge 1972-vintage taillights in to the alleged "T1.5" and created until 1996. The Brazilian T1s weren't identical to the very last German brands (the T1.5 was locally manufactured in Brazil with the 1950s and 1960s-era stamping dies to lessen retooling, alongside the Beetle/Fusca, in which the pre-1965 human body design was retained), though they sported some characteristic options that come with the T1a, such as the cargo doors and five-stud 205 mm (8.1 in) Pitch Circle Diameter rims. Wheel tracks varied between German and Brazilian production in accordance with 14-inch, 15-inch and 16-inch wheel variants but generally front track varied from 1290 mm to 1310 mm and back track from 1370 mm to 1390 mm. Among US fans, extremely common to mention on different models by the amount of their windows. The basic Kombi or coach is the 11-window (a.k.a. three-window coach as a result of three negative microsoft windows) with a split windshield, two front cabin home windows, six rear part windows, and something back screen. The luxurious design featured eight rear part house windows and two back part house windows, rendering it the 15-window (not available in Europe). Meanwhile, the sunroof DeLuxe along with its additional eight little skylight windows are, properly, the 23-window. From 1964 model year, using its broader rear home, the rear place house windows had been discontinued, making the latter two the 13-window and 21-window respectively. The 23- and later 21-window variants each carry the nickname 'Samba', or perhaps in Australia, formally 'Alpine'. The Volkswagen Samba, in america also known as Sunroof luxurious, is the most luxurious type of the Volkswagen Transporter T1. Volkswagen started making Sambas in 1951. Into the sixties this variation became popular as a hippie coach. Initially Volkswagen Vans are classified in accordance with the wide range of windows they had. This model have 23 and soon after 21 windows including eight panoramic windows in roofing. To tell apart they from the regular 23 or 21-window Volkswagen van the name Samba is coined. Rather than a sliding door during the part the Samba have two pivot doorways. Also the Samba have a fabric sunroof. At that moment Volkswagen advertised with the concept of with the Samba in order to make visitor trips through the Alps. Sambas are standard painted in 2 colors. Typically, the top of component ended up being coloured white. The 2 coloured sections were split by a decorative strip. More the coach have a so-called "hat": at the front end associated with van the roof ended up being somewhat more than the vehicle it self to stop the sunlight for the driver. The windows had chrome tables as well as the van had a more extensive dashboard compared to the normal T1. When Volkswagen began producing the successor regarding the T1 (the T2) the company furthermore ended creating the Samba so are there no Sambas in later on versions of the Volkswagen Transporter. Find great deals on eBay for vw kombi vw bus. Shop with confidence. Used VOLKSWAGEN KOMBI for sale - Browse for used VOLKSWAGEN KOMBI for sale on Auto Trader, South Africa's biggest provider for used VOLKSWAGEN KOMBI cars.